The 1927 New York Yankees season was their 25th season. 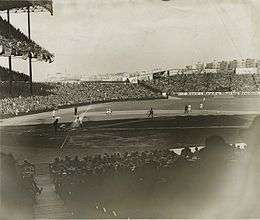 The team finished with a record of 110–44, winning their fifth pennant and finishing 19 games ahead of the Philadelphia Athletics and were tied for first or better for the whole season. New York was managed by Miller Huggins. The Yankees played at Yankee Stadium. In the World Series, they swept the Pittsburgh Pirates. This Yankee team is known for their feared lineup, which was nicknamed "Murderers' Row". This team is widely considered to be the best baseball team in the history of MLB. The Yankees' 110 victories broke the previous American League mark of 105 (set by the 1912 Boston Red Sox) and would stand as the American League single-season record until it was broken by the Cleveland Indians in 1954. This was the first year the Yankees acknowledged their team nickname on their uniforms, albeit their road uniforms. Their home uniforms remained free of any kind of logo except for the "NY" on their caps. The roster included seven future Hall of Famers: Pitchers Herb Pennock and Waite Hoyt, Infielders Lou Gehrig and Tony Lazzeri, outfielders Babe Ruth and Earle Combs, and Manager Miller Huggins. With the race long since decided, the nation's attention turned to Babe Ruth's pursuit of his own home run mark of 59, set in 1921. Early in the season, Ruth expressed doubts about his chances: "I don't suppose I'll ever break that 1921 record. To do that, you've got to start early, and the pitchers have got to pitch to you. I don't start early, and the pitchers haven't really pitched to me in four seasons. I get more bad balls to hit than any other five men...and fewer good ones." Ruth was also being challenged for his slugger's crown by teammate Lou Gehrig, who nudged ahead of Ruth's total in midseason, prompting the New York World-Telegram to anoint Gehrig the favorite. But Ruth caught Gehrig (who would finish with 47), and then had a remarkable last leg of the season, hitting 17 home runs in September. His 60th came on September 30, in the Yankees' next-to-last game. Ruth was exultant, shouting after the game, "Sixty, count 'em, sixty! Let's see some son-of-a-b**** match that!" In later years, he would give Gehrig some credit: "Pitchers began pitching to me because if they passed me they still had Lou to contend with." In addition to his career-high 60 home runs, Ruth batted .356, drove in 164 runs and slugged .772. Since a voter could select only one player per team, two good candidates from the same team could find their votes split and both of their chances of winning hurt. In addition, the clause prohibiting repeat winners led to unusual results like Babe Ruth's 1927 (one of the greatest offensive seasons of all time) not being eligible for the award. As The New York Times wrote in 1925, "[T]he purpose, of course, is to pass the honor around, but the effect is to pass an empty honor around."